December 28, 2011 — EVANSTON, ILL. — "Welcome back, everyone!" said Director of Athletic Bands Daniel J. Farris, as the members of the Northwestern University "Wildcat" Marching Band gathered on the indoor turf at Trienens Hall. The band growled in excitement. In just hours, they will board a chartered flight from O'Hare International Airport and fly to Houston, Texas, in support of the Northwestern football team as they look for a victory at the Meineke Car Care Bowl of Texas. "It's very exciting to be going back to Texas," said drum major Michael San Gabino (Mu13). He conducted the band at its bowl performance in Dallas last year. December 14, 2011 — EVANSTON, ILL. — "Spread far the fame of our fair name! Go, Northwestern, win that game!" sang Nick Arcos, a mellophonist from the Northwestern University "Wildcat" Marching Band, as he appeared on KHOU-TV's Great Day Houston program Tuesday. The purple-clad Northwestern fans in the television audience burst into applause and cheers. Arcos represented his alma mater while competing against one, then two, contestants from Texas A&M University in a challenge to see which school's fans could better sing their school's fight song. Host Deborah Duncan first introduced Bill, an Aggie fan, who could not find the words as a recording of the Fightin' Texas Aggie Band played. "Any Aggie fans in the audience here? Come on down and help Bill out!" cheered Duncan. Soon, another fan joined Bill, and together they sang "The Aggie War Hymn" as A&M fans clapped along in tempo. Then, Arcos was introduced, even wearing his Wildcat Band t-shirt, which read "NUMB 1911-2011." November 9, 2011 — EVANSTON, ILL. — The nation's fourth largest city is about to welcome the Northwestern University "Wildcat" Marching Band for their record-breaking fourth bowl game appearance in a row. "We will be traveling to Houston on December 29," says Daniel J. Farris, Northwestern University director of athletic bands. "There are still many details to be worked out." The fall term has just wrapped up on the Evanston campus, and after one last rehearsal, students have headed home for the holidays. The band, like the team, will return to Evanston early to prepare for its first-ever appearance at the Meineke Care Care Bowl of Texas. The game will be played at Reliant Stadium at 11 a.m. on New Years' Eve. The Wildcats' eligibility for the bowl game is owed mainly to a four-game winning streak in the last half of the season, during which Northwestern upset ninth-ranked Nebraska while on the road. This year's is the winningest senior class in school history, with 36 wins. November 26, 2011 — EVANSTON, ILL. — The persistent drizzle in Ryan Field today could not wash away seniors' tears as they were recognized for their years of service in the Northwestern University "Wildcat" Marching Band. It was a day for emotional traditions. The halftime finale was "March of the Steelmen," which has been performed by the Wildcat band at the end of each home season since 1928, "just two years after the dedication of Ryan Field's predecessor, Dyche Stadium," explained Pete Friedmann, the Voice of the Wildcat Band, whose words reverberated through the P.A. system. "This year, once again, we salute our seniors and you, our loyal fans," said Friedman. Then, Friedmann introduced each of the ensemble's twenty-seven members who are finishing their tenure this season. Mary Baker of Frankfort, Ill., fought to contain tears as she joined the other graduating saxophonists at the front of the field. They and the rest of the seniors joined arms and swayed as Director of Bands Mallory Thompson conducted the University Hymn. 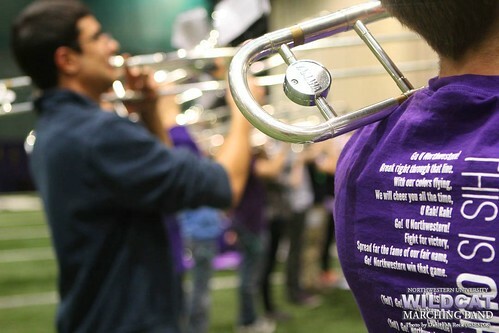 November 9, 2011 — EVANSTON, ILL. — A high school band in Palm Bay, Fla., cites the Northwestern University "Wildcat" Marching Band among others as its inspiration, according to Florida Today in a recent article. James Bernard Wilkins, director of the Panther Marching Band at Heritage High School, describes his band as "a combination of an older style from Texas A&M, Michigan State, Ohio State, and Northwestern universities and the historically black universities and colleges of today." The Wildcat Band finds itself referenced in good company. Each of the named bands is a winner the Sudler Trophy, which is awarded by the John Philip Sousa Foundation to "recognize collegiate marching bands of particular excellence." The foundation's statement of purpose for the award says receiving bands "have made oustanding contributions to the American way of life" and have "demsontrated the highest musical standards and innovative marching routines and ideas."